Is the weather beautiful where you are today, too? It is supposed to hit almost 50 degrees in Boston and I am loving every minute of it. Now I only wish I had the energy to get outside and enjoy it a bit more! You see…I had my wisdom teeth removed yesterday and am currently hunkered down on the couch with icepacks on my face. Things went smoothly, but I’m looking forward to a fully healed mouth! On a positive note, however, this occasion inspired me to create a deliciously savory, yet slightly sweet, butternut squash soup. It is wonderfully thick and creamy, and makes the perfect meal not only for those with a sore mouth, but for anyone craving a warm bowl of comfort. Though I maintained a “soft diet” by serving my soup with a bowl of mashed potatoes and a side of vanilla pudding…I would highly recommend sopping up your own bowl of soup with a good slice of crusty bread. 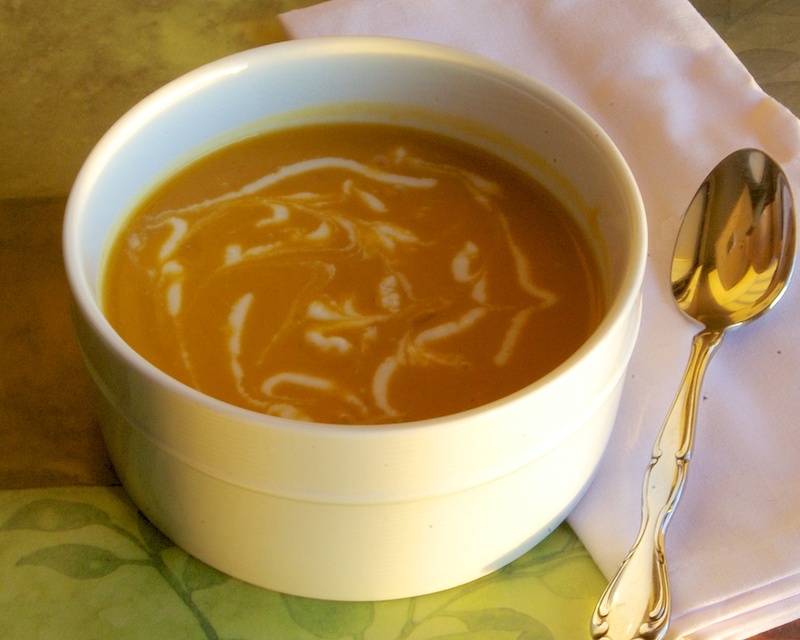 Paula’s Notes: This is one of those wonderful soups in which the flavor improves the longer it sits. Prep ahead and have tasty soup all week long! You may also use vegetable broth for vegetarian/vegan option. Heat oil over medium heat in a large stock pot. Add onion, butternut squash, and smashed garlic. Cover and let soften for about 10-15 minutes, stirring occasionally. Add in chicken stock and seasonings. Allow soup to simmer an additional 20 minutes or until vegetables are VERY tender. Using an immersion blender (or transfer to a food processor in batches) blend soup until perfectly smooth and creamy. Add in milk and reheat. Serve garnished with a dollop of sour cream or Greek yogurt, if desired. I'm definitely rocking the smoothies, too Sally. They're delish!